Hello, Dolly! Chenault Productions 1969. I’m sure there are other movies that reach this level of substanceless fame, and probably ones that I’ve reviewed here before, but while I know I’ve reviewed well-known movies nobody actually seems to discuss the content of before, I can’t think of one so big yet so mysterious. The Front Page. Universal Pictures 1974. Back when I was in a film studies class, I was shown a movie titled His Girl Friday. Apparently, this movie is a more faithful adaptation of the play that movie was based on. As my professor was also apparently a fan of Billy Wilder, I’m not sure why this film didn’t come up in a way that I remember. Also, this one has Walter Matthau, Jack Lemmon, Carol Burnett, and Susan Sarandon, a trainload of fun people to watch. 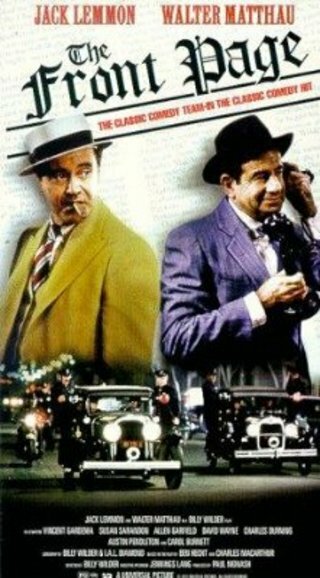 I didn’t know Matthau and Lemmon worked together outside of The Odd Couple, but the box seems to imply they were a popular comedy team.